Select your desired options to find the best Huawei Mate 20 Pro deals for you. 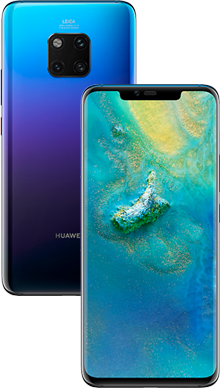 Huawei have done amazing things with their technology in seriously fast time and produce many handsets that sit at the top end of the marketplace and offer colossal functionality making them one of the most wanted when it comes to mobile phones. 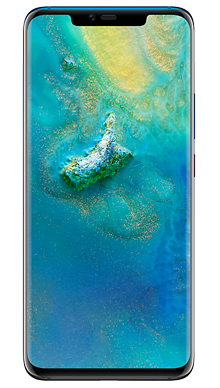 The newest flagship to their fold is the Huawei Mate 20 Pro which is a high-performance phone packed full of some seriously weighty technology and offering users a stunning handset performance. Pre launch the interest was already building, and there is little doubt that this will be flying off the shelves, with a steady band of Huawei followers growing as more and more people see the amazing power and performance that comes from these giants of mobile phone technology. Opting for the currently popular infinity screen look the handset big, which is excellent for the growing number of users who like a decent size on the screen. This one measures an impressive 6.9 inches making it one of the biggest on the market. 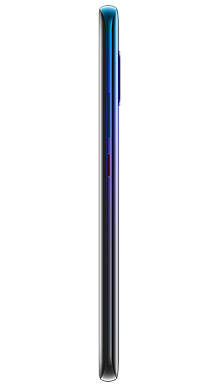 The edges of the handset are quite angular setting their design apart and throwing their own incredible styling, it looks good and is finished in, as you would expect at this level, glass and metal. There is a tiny notch at the top for the front-facing camera lens, which finishes the look and makes this a really classy looking handset. 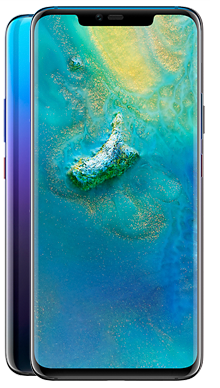 The Huawei Mate 20 Pro boasts an AMOLED screen that offers 1440 x 3120 resolution which is a stunningly bright, pixel perfect image display with an aspect ratio of 19.5:9 making this a great candidate for streaming movies or playing games on a 498ppi dense screen. In order to bring the valued element of robustness the screen is also Corning Gorilla glass, with dust proofing and a waterproof rating of IP67. The display is bright but fully adjustable, and the colour tone is true to life and really lovely to look at. On the rear of the handset you will find a triple camera set up, which is cleverly arranged in a quad with the flash taking the last spot and really gives the handset a unique and eye catching look. This is a handset that is going to appeal to many users as there is a considerable amount of functionality and the large screen has many social and business advantages. The handset is being offered in three colours for those who like a bit of variety so you can choose from black, gold and dark blue. The Huawei Mate 20 Pro offers a great audio performance with the onboard speakers meaning this is perfect for streaming movies in a quiet room. Huawei has chosen to leave a standard 3.5mm headphone jack, and the playback through the headset is fantastic. You can certainly get into the movie or game as you will hear the more subtle sound effects and game noises clearly. Music playback quality is equally good with a nice depth of sound resonating both through the speakers or the headset. So, this is one of the features that has everyone talking in excitiment. The new square camera set up on the back features three lenses, with a cracking 40MP. Big camera technology is something we have come to expect from Huawei, but this newer and clever step forward puts them top of the camera rank and is an awesome way to get themselves noticed. The front facing camera packs a whopping 24MP punch, and there is plenty in the way of software to support budding photographers. 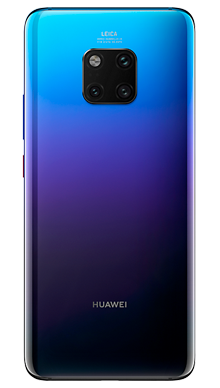 Another new feature of the Huawei Mate 20 Pro is the biometric fingerprint scanner, which in itself might not be a new feature but this time Huawei has added the scanner as an onscreen sensor meaning there is no scanner on the shell of the phone, which again is really innovative. Under the hood, you will find an Octa-Core (2.6 GHz, Dual core, Cortex A76 + 1.9 GHz, Dual core, Cortex A76 + 1.8 GHz, Quad core, Cortex A55) HiSilicon Kirin 980 chipset that offers 6GB of RAM. Unsurprisingly the phone is running Android Pie which is the latest incarnation of this operating system so you can see how easily this phone is going to be able to cope with resource heavy games and movies. The battery is a serious means business offering coming in at 4200mAH meaning that you should be able to take the phone out for the day and still have power when you get home even if you have been using it a lot. Given that this is a top end phone Huawei the price tag sits at the higher end of the market along with the handset but for the number of features found within we can see why. It is a smart handset that is packed full of power from the chipset, battery and operation system trio. We knew that this was going to be a popular handset, so we got our best team on the case and sent them looking for cracking deals. They have not disappointed us and have returned with a range of contract deals to suit all types of user. Our two network providers, EE and Vodafone, have both given us some exclusive and impressive deals including no upfront cost options. They are also still generously offering a great range of extras from Sky Sports to Spotify and many other great offerings for you to choose from. When you choose to purchase a product from Fonehouse, you are purchasing from one of the UK’s leading independent mobile phone retailers. We’re proud to deliver some of the very best mobile phone deals on the market, with our team of experts who work tirelessly around the clock to ensure that we also give you the very best price for your new mobile phone deal. At Fonehouse we have several network partners including EE & Vodafone. By giving our customers a fantastic deals on these networks, we can be sure that they always have the best service and network connection no matter where they are. With free roaming, you can connect to anyone and everywhere, even when you’re on the other side of the world. When you shop with Fonehouse, you could get your hands on a fantastic cashback offer, saving you even more money. Plus, every time you take out a new pay monthly contract with us, you have the chance to be entered into a prize draw to win an incredible new Samsung Galaxy S9 handset, solely by providing us feedback! At Fonehouse we off free next day delivery with all of our orders, so you could have your new handset the very next day. We offer free next day delivery with all products, when ordered before 8pm Monday-Friday. We hope you are happy with your purchase. However, we understand that sometimes you might change your mind. Please contact us within 14 days to see how we can help. Call our UK based customer service team where a trained member of staff will be on hand to assist with your mobile phone purchase. Take advantage of out one month free mobile phone insurance. Click to buy or call into our UK based call centre. We use SSL (Secure Socket Layer) technology. When you place your order with us all information you share with us is encrypted for your security. If you choose an EE deal your monthly price plan charge will be increased by RPI in March of each year. Other prices, such as call charges and roaming costs, may also go up during your plan. For full details please see section 7 of the Network terms and conditions. Unless otherwise stated, any cashback or gift incentives are provided by us, and not the network operators. ©2018 All rights reservered E&OE. fonehouse.co.uk is part of KTM Online Limited. Reg. No. ‍10781202. VAT Reg. GB ‍276 ‍6191 ‍72. Monthly prices may rise in line with RPI. You have been added to our newsletter mailing list.